Really, do any of those words go together? Chipped Beef? Beef on Toast? Creamed anything on toast? Also known as Sh*t on a Shingle, this delicacy was served up in my house often when I was a kid. 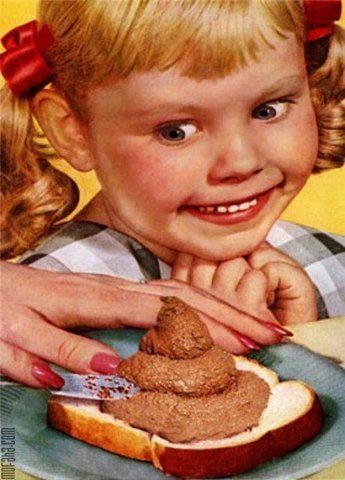 Yeah, it tasted like sh*t on a shingle. Looked like it, too. Not that I’ve ever eaten a shingle – or the other part for that matter. It’s no wonder that on Creamed Chipped Beef on Toast night I’d go outside and eat all the apricots off the tree in the backyard (which I’d then puke up all over my bedspread in the middle of the night). Well, I had to eat something. And it sure as hell wasn’t gonna be that creamed stuff. Strangely, people actually like Creamed Chipped Beef on Toast. My Dad did; my sisters did, too. I think they still do. Mom would use those fake packaged Land O’Frost luncheon meat slices to make this. You know, the kind that costs about 12 cents a package. It’s quality sh*t.
Jay would probably love for me to make this — though I’m not going to. But hey, if you like mushy bread swimming in a creamy flour yuck sauce with fake meat, then by all means, fix this one. This recipe results in about 2 cups of gravy, enough to feed four lucky family members. Melt butter in a saucepan over low heat. Add flour and whisk to make a roux. (That sounds pretty fancy. I don’t think Mary Ann knew she was making a roux.) Add the milk to the pan. If you add warm milk, the gravy will be done faster, in case you just can’t wait to get to the dinner table with the stuff. Use cold milk and it will take longer (recommended – there’s always the hope that a friend or family member will show up at the door with a pizza before this creamed stuff is finished). Warm or cold, whisk the milk with the roux constantly until thickened. Chop up those fine slices of luncheon meat and add to the cream stuff. Salt and pepper to taste. Serve over toast – about two pieces per person. You’ll know you’ve got the recipe just right if it looks like your dog barfed (or something else) on a wet piece of Wonder Bread.